Niagara Falls, NY - Kyle Armstrong with Pioneer Motor Sports shows off a GEM street legal low speed vehicle to Brett Newton and Bill Aungst of NYS Parks. 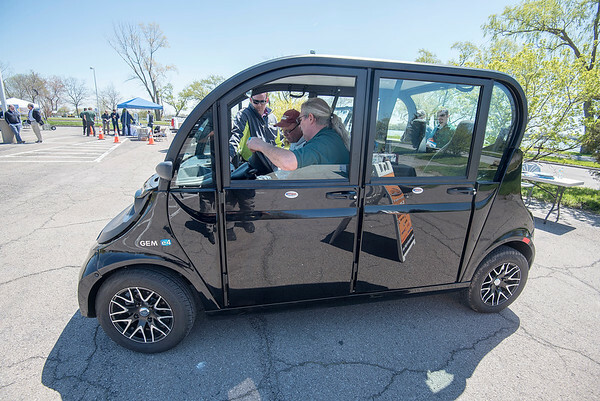 New York State Parks hosted a Ride and Drive Event featuring alternative fuel vehicles on Tuesday. The New York State Office of Parks, Recreation and Historic Preservation (State Parks), and Clean Communities of Western NY will host a "Ride-and-Drive" event featuring clean fuel vehicles from 10 a.m. to 3 p.m. on Tuesday, May 9 on Goat Island at Niagara Falls State Park. The event will showcase clean fuel vehicles, construction and maintenance equipment that can help state agencies, local governments, private companies and individuals reduce emissions. Visitors with a valid driver license will be able to test out sedans, SVUs, pick-ups, vans, utility vehicles, golf-carts, off road and on road vehicles, construction and maintenance equipment, charging stations and more from over 20 vendors. All featured vehicles and equipment are powered by a variety of hybrid, plug-in hybrid, electric, compressed natural gas (CNG), hydrogen and propane engines. Information specialists will be able to answer all questions on the vehicles and equipment. Additionally, the New York State Energy Research and Development Authority (NYSERDA) will be on hand to discuss Governor Andrew M. Cuomo’s new initiative that will allow for tax rebates on electric vehicles and electric charging stations. Vehicles will be on display in the Goat Island Parking Lot 3. Admission as well as parking in Lot 2 will be free and there will be a free shuttle back and forth between the two lots. The rain date is Wednesday, May 10. The event continues State Parks' efforts to make the park system a model of sustainability practices. Clean fuel vehicles make up 26 percent of State Parks vehicle fleet, and a project to install a 693 kilowatt solar system at Robert Moses State Park will make it the first energy neutral state park in the nation. New York State Office of Parks, Recreation and Historic Preservation oversees 180 state parks and 35 historic sites, which are visited by 65 million people annually. For more information on any of these recreation areas, call 518-474-0456 or visit http://www.nysparks.com, connect on Facebook, or follow us onTwitter.